Bennett DriveAway | What's New? Bennett DriveAway - What's New? Bennett DriveAway Signs New Contract To Deliver Hino Truck! In 2011 Bennett's DriveAway division worked with Vascor Logistics to provide single DriveAway services from Hino Motors Manufacturing USA of Williamstown, WV. Bennett DriveAway's President Gerald Fitzgerald said that it was a great opportunity for Bennett and the DriveAway division. Mr. Fitzgerald has been to the plant facility to help manage the start up operation. The management team, operations and contractors of Bennett are excited about the new opportunity and are looking forward to proving once again our commitment to service that we already provide to the growing list of loyal customers of DriveAway! Hino entered the U.S. market with a cab-over engine (COE) medium duty truck in 1984, evolving to the current conventional trucks first introduced in the U.S. in 2004. Established over 90 years ago in Japan and now majority owned by Toyota, Hino is the world's largest manufacturer of light and medium duty trucks. Today, as Hino celebrates 25 years in America, it has also become the fastest growing medium duty truck OEM in the U.S.A.
Today the plant currently produces 25 trucks a day on one shift and they have plans to increase that number. These trucks on one shift means that a new, fully-assembled truck chassis comes off the line every sixteen -and-a-half minutes. Bennett and the DriveAway Division is excited about our new opportunity and look forward to building a strong Partnership and Relationship as we grow together. 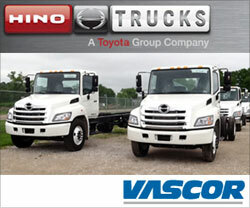 We are proud to add the Vascor/Hino Company to our already long list of satisfied customers. And we are proud to put The DRIVE in DriveAway! Vernon Watts joined Bennett Motor Express as a DriveAway driver in 1992 and worked out of the Morgantown, PA office. In October 1993, he became a DriveAway Terminal Manager and took over the office in Springfield, OH. Vernon was selected as DriveAway agent of the year in 1994. In 2002 he took over as Terminal Manager for the Morgantown, PA office. Vernon was voted the DriveAway Terminal Manager/Agent of the 3rd quarter 2010. Vernon has been married to his wife Denise Watts for 27 years. They are the parents of 3 children, 2 girls and a son. Missy is a nurse and Danielle a teacher, and their son Gregory is a college freshman studying Criminal Psychology. Vernon attended the University of Arkansas Pine Bluff from 1962 to 1972 and served in the United States Air Force from 1976 to 1990. Being agent of the year gives personal recognition for dedicated hard work and team work. It provides a sense of pride and looking at goals accomplished, being able to maintain and supersede company goals. It gives the agent a satisfaction in knowing the line between the drivers and central dispatch can be easily maintained through open communication. We are proud to announce that the recipient of the 2010 Fleet Manager of the year for DriveAway is Wayne Woodall. At our Annual Symposium in February, Wayne was presented with the prestigious Fleet Manager of the year. Wayne started his carrier with Bennett in 1998 in the Freight Division of Bennett Motor Express. In August of 2002 he transferred to the DriveAway division and has been a part of the operation team ever since. Wayne is happily married to his wife Ann of 39 years. They are proud parents of two beautiful daughters and have 4 grandchildren, two girls and two boys. Obviously the joy of both Wayne and Ann. Wayne and Ann have raised their daughters in a Christian environment and enjoy as a family going to church each week. Everyone on the operations as well as management team enjoys working with Wayne and his continued commitment to provide the service that is both required and deserved by our many customers that Wayne has the pleasure to work with each day as well as the many fine contractors that support that commitment. We asked Wayne what receiving the award meant – " This award made me feel like I made a difference" Wayne you have and we are proud that you are our 2010 Fleet Manager of the Year!